Vijay Shankar is an International Indian cricketer who plays for the Indian cricket team and domestic cricket for his state Tamil Nadu. Vijay Shankar is a young All-rounder and Right-Handed Batsman and Right-Arm Medium pace Bowler. Vijay Shankar in the Indian Premier League (IPL), he has played one match for the Chennai Super Kings in 2014 and four for Sunrisers Hyderabad in 2017. Currently, in IPL-2019, he is playing for Sunrisers Hyderabad. Vijay Shankar was born on 26th January 1990 (29-years-old) who hails from Tirunelveli, Tamil Nadu. Vijay Shankar till date has played 9 One Day Internationals (ODIs) and 9 Twenty-Twenty (T20Is) matches for Indian national team. Vijay Shankar made his ODIs debut on 18 January 2019 against Australia and T20Is debut on 6th March 2018 against Sri Lanka. Vijay Shankar so far has scored 165 ODIs runs and 111 T20Is runs and 3,000 runs in first-class cricket. Also, he took 2 wickets each in ODIs and T20Is matches and 77 wickets in first-class matches. 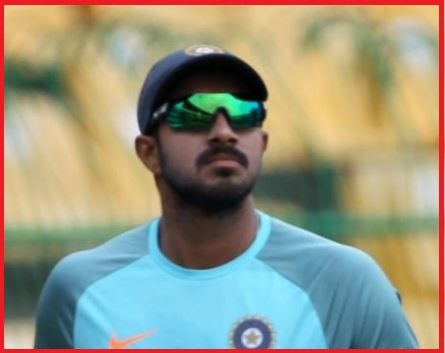 Recently, on 15th April 2019, Vijay Shankar was selected in India's squad for the 2019 Cricket World Cup.